Velvet Paw Creations: Dark Etchings - Series 1 + Week 2 ATC challenge with Smudgy Antics! Dark Etchings - Series 1 + Week 2 ATC challenge with Smudgy Antics! I've been having fun this last week playing with a technique that I call faux etching coz it reminds me of the print etchings I did when I was a Fine Art student. 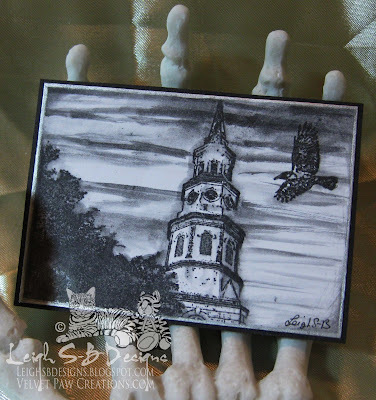 So first up I'm sharing the ATC I made for week 2 of Smudgy Antics "ATC" challenge! Faux etching is so much fun and really simple to do. All you need for the this ATC is a piece of heavy weight cardstock measuring 2.5" x 3.5" which is the standard size for an ATC which FYI stands for Artist Trading Card for those unfamiliar with the format. Stamp the architectural image from May's Smeared Ink exclusive Rubber Club set called Holy City with Black Soot Distress Ink. 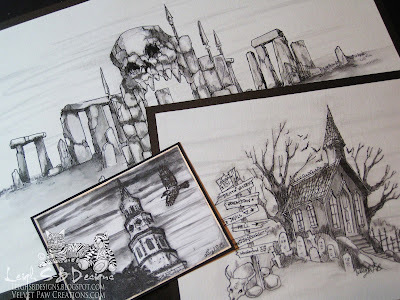 Then simply apply water to the image with a Japanese water brush pen that has the built in water reservoir or use a traditional paint brush with water to achieve the same result. The water picks up the stamped ink and it's similar to watercolouring and you can make areas even darker by picking up more ink from the ink pad...I created the sky by painting the ink on with the brush. Once I was happy with the sky I stamped the flying bird which is also from the Holy City set. I then edged the ATC with a metallic silver paint pen and adhered it to black cardstock and used my Perfect Layers tool to cut the 1/16" black border. I've got more Dark Etchings to share this week featuring Smeared Ink's September Rubber Club exclusive sets Haunted Places 1 and 2 so stay tuned!! Thank you for visiting with me today and I hope you'll come and play in our Smudgy Antics challenges!